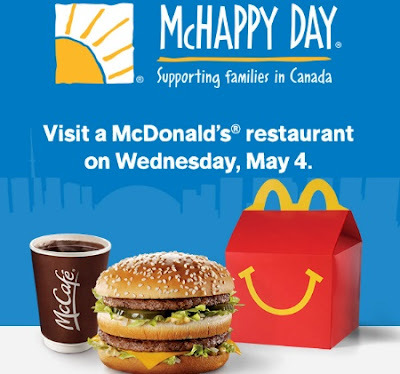 Mcdonalds McHappy Day is back this Wednesday May 4! When you take part you will be supporting local children’s charities and over 20,000 families across Canada each year, who are staying at Ronald McDonald House, while their kids are being treated. 1. Buy a Big Mac, Happy Meal, or hot McCafé beverage. 2. Make a donation in our RMHC coin box. 3. Donate $5 and get a pair of McHappy Day Hero Socks. Limited quantities available while supplies last. 4. Buy a paper Ronald Shoe and sign your name. Limited quantities available while supplies last.